Does this picture of dessert cat remind you of anyone you know? I don’t know about you, but this feline reminds me of…me! I was at a company dinner, which was really expensive. Like $ a steak expensive. 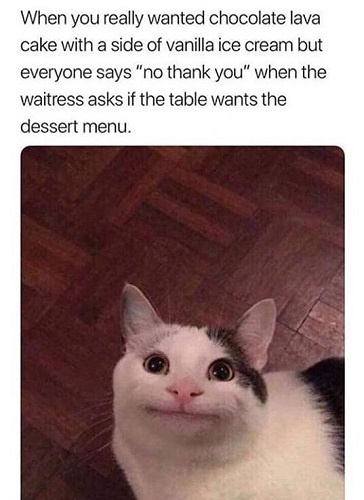 The server came around asking if anyone wanted dessert. I think it would have been in bad form to opt for a $28 slice of pie after a tiny $50 steak. No one did, lol. Put down that scoop of deliciousness and follow us on Facebook and Friendslr and Twitter for new stuff nearly every day! Or, right here on Laughshop.com, or course. Shoot, we’re so old we even have a MySpace page!